My fascination with hand planes began one year when my Dad gave me a Stanley 4-1/2 smoother and a Stanley 78 rabbet plane for Christmas. He found them in his shop and since he’s a power tool kind of guy, didn’t have any use for them. I had always used power tools in my woodworking because that’s what Dad always used. The last time I had tried to use a hand plane was when I was a young boy. I’d go down to my Dad’s basement shop and spend hours “building” things. But trying to use his hand plane was so frustrating, I gave up. It wouldn’t cut and it kept tearing out the wood. So I took these two planes he had given me and researched online to figure out how to “fettle,” or “tune” them so that I could use them. I wasn’t interested in them as collectibles — I wanted to use them. I learned how to disassemble them, clean them, lap the soles flat, and sharpen the irons. And on the 4-1/2 smoother, I had read that replacing the original iron with a thicker one would improve performance. So I ordered a replacement iron from Ron Hock. I Finally got the planes put back together and set them for a fine cut and tried them out on a scrap piece of oak. When I saw that thin, continuous shaving curl up, I was literally awestruck. “So, this is how it’s supposed to work!,” I thought to myself. I was hooked. I spent the next several minutes taking shavings from almost every kind of scrap wood I had lying around. Over the following years, I started collecting planes to refurbish and use in my shop. I’ve bought planes from online auctions, yard sales, and from tool dealers. I get a great deal of pleasure from “rust hunting” and bringing an old tool back to life to use in my shop. My kids have even participated in restoring old tools. Of course, the online “bible” of Stanley planes is Patrick Leach’s “The Superior Works: Patrick’s Blood and Gore.” I use this site to read and research all the old Stanley and Bailey hand planes. As for making my own planes, I’ve not made any yet, but I intend to do so soon. I don’t know why. Part of it is economics. Part of it is being able to make them to suit my needs. For example, I’d like to make a set of molding planes to use instead of a noisy router to make decorative edging. Having said that, I did save up my pennies and purchase a new Veritas Low Angle Smooth Plane and a Veritas Medium Shoulder Plane. “Why?,” as my wife so eloquently asked. I already have a nice collection of vintage planes. Why would I want to spend so much on a new one? Well, part of it has to do with technology. The Veritas plane has an adjustable mouth to eliminate tearout. It’s a “bevel-up” plane, meaning that the iron is bedded with the bevel up, instead of down as in a traditional hand plane. This means that the cutting edge is better-supported and eliminates the need for a chip breaker. And it’s a lot easier to adjust the bevel angle to deal with difficult woods. I chose the Veritas plane over a Lie-Nielsen because of the cost and because the Veritas planes incorporate a finely-machined lateral and depth adjustment mechanism for the plane iron. As for the shoulder plane, I didn’t already have one so I opted for a new one instead of one of the “classics.” The Veritas shoulder plane has a lot design features that make it attractive. I enjoy working with hand tools in my shop. I enjoy the peace and quiet. I’ll use a power tool when I need to, but the whine of a table saw or the screech of a router doesn’t do much for my peace of mind. 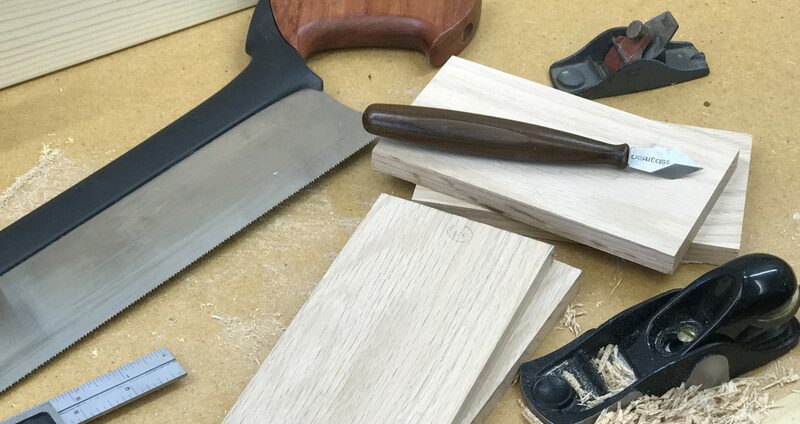 To me, there’s nothing like the sound of a thin curl of wood rising out of the mouth of a hand plane.